The Diamond Head Hike with a duration of 3 hours (Round-trip with pick up and drop off from your Waikiki hotel) enjoy the breathtaking views of Waikiki & Honolulu. Located along the southeast coast of Oahu, Diamond Head Trail is a 1.6 miles (Round-trip) hike and a must-do for all visitors! The historic hike is also simple enough for most ages and people with no hiking experience to enjoy. This tour also includes a brochure of Diamond Head and a bottled water! Take a shuttle from your Waikiki hotel at 6:20 AM or 8:20 AM at the famous Diamond Head Crater, the most popular hiking trail on Oahu! The driver will give you a bottled water and a brochure of the Diamond Head Hike with some information inside. This self guided tour goes on rain or shine and is a must do at the earliest departure times for the hike since it's such a popular destination. It can get crowded at the narrower stretches of the path as more visitors arrive throughout the day. 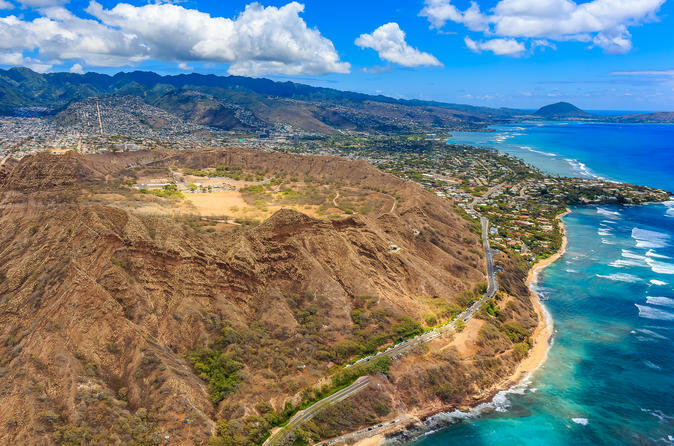 Hiking the Diamond Head only takes about 60 minutes to reach the 760-foot summit.Park fees included ONLY when traveling with Kaimana Tours.Drinks, shave ice and snacks are available for purchase at the park. Toilets and drinking fountains can be found at the beginning of the trail but not along the hike nor at the summit.